The North Highland Way links up with the Cape Wrath Trail (CWT) in the west which was officially opened in January 2013. 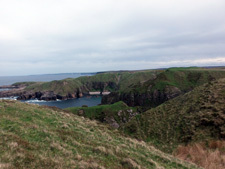 The full length of the route from Duncansby Head to Cape Wrath is 116 miles by road and 150 miles round the coast and goes through some of the most spectacular countryside in Scotland, if not in the world. The walk can be completed in different ways, with a route by road and a route along paths and wild walking usually done in 13 stages, though it can be done in 10. Some of the current ‘path’ route is in fact on the road, especially around Loch Eriboll, and the organisers are working hard to ensure that access issues are addressed by working closely with the Highland Council Access Officer and we are currently doing a land owner survey. Of course you can work out a mixture of the available routes. We have linked up with another long distance walk from Inverness to John O’Groats (www.jogt.org.uk). We are hoping to link up with the Cape Wrath Trail and the Great Glen Way (The Great North Highlands Loop Walk). It is very remote in various areas so please bear in mind that you may not have a mobile phone signal for long periods of time and distance. On reaching the ‘wild’ part of the NHW it becomes a lot more rugged than the east side with quite a lot of steep geos to circumnavigate but the views are spectacular! There are four quite large hills between Armadale and Kirtomy to the navigated. It is not recommended that you traverse this section alone. It should be noted that for any walk(s) along the NHW, as a precaution, walkers should ALWAYS leave details of your route and timings with someone. Another difficult section is the part between Achininver and Hope. The organisers are trying to get land owners permission to place way markers to assist walkers but walkers should avoid attempting this section alone. The section from Hope to the Cape Wrath ferry is logged as being partly on the road due to the proximity to cliff edges. From the Ferry you can either go around the coast or follow the good track to the Cape Wrath Lighthouse, where there is also a small cafe. For the trip back it is suggested that the minibus is used otherwise you might miss the last ferry. There’s information about access – rights and responsibilities – on the Scottish Natural Heritage and Outdoor Access websites. Information can be found on our Transport page.